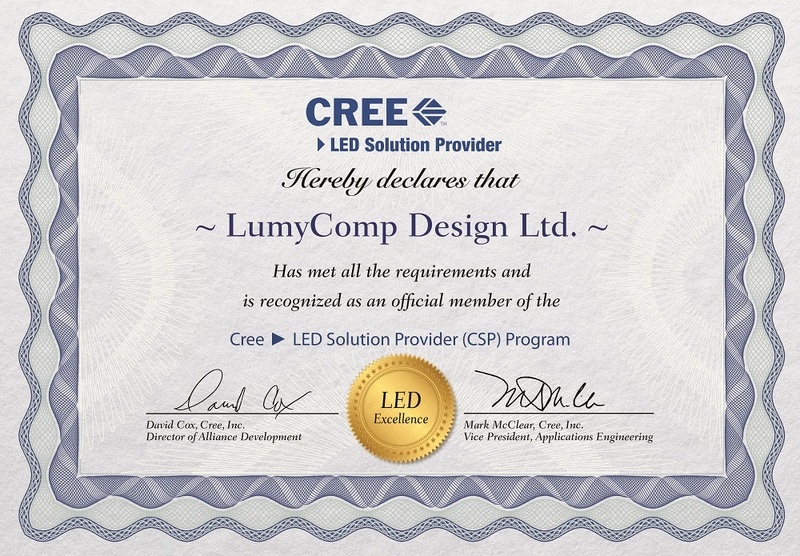 Cree Solution Providers offer a full range of LED lighting-system solutions and design assistance to lighting customers who need help to accelerate time-to-market and reduce product development costs. Network members work closely with Cree to help ensure alignment of technologies and comparable high quality. Design services make up significant part of LumyComp Design activities. Thanks to their extensive experience and thorough knowledge of LED technology, our staff conducts complex innovative product designs that fully avail the advantages of LEDs. We approach each project individually to meet the Client's expectations. Thanks to LumyComp Design location in the High-Tech Technology Park in Sofia, we have access to modern laboratories and technological solutions that we use to fulfil Client orders. We use only proven, high quality LEDs. Our main objective when providing design services is maximum utilization of all of the advantages of LEDs, so that the final product surpasses traditional lighting technologies with its capabilities and properties. technical consulting in LED lighting. LumyComp Design makes designs and manufactures custom LED modules that meet the individual needs of Clients. We produce prototypes, small and large production runs of LED modules. By optimizing the fabrication process, the production duration for new LED modules is reduced to a minimum. Before ordering, we encourage you to prepare answers to the questions below. These answers will enable fester and better cooperation. How will the LED module designed by be used (e.g. industrial lighting, decorative lighting), where will it be found (interior, exterior lighting), what is the expected lighting effect? How many LED modules will need to produce? What dimensions and shape are the finished LED modules to have? What lighting parameters are the finished LED modules to have: luminous flux (in lumens), colour temperature (cool, natural, warm), beam angle, colour coefficient? What power parameters (voltage, power) are preferred for this project? What control options should the LED module have (e.g. surge, thermal)? What will be the preferred cooling methods for the designed LED module? What safeguards should the LED module have (e.g. surge, thermal)? What is the expected operation duration of the module (e.g. 5 hours a day for the next 4 years)? What lighting standards is the designed LED module to meet? What is the expected completion date for the prototype, first production run?